Top quality skateboard manufacturer not to mention making skateboards for over 20 years. Cheap factory direct prices and made in USA! Design online and buy in bulk to get the best price possible on your next order of decks. 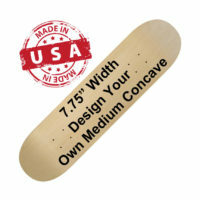 Boards made with state of the art equipment and machinery. Designed to take large orders and small we can handle any quantity you throw at us. With more than enough manufacturers in the market today we have kept the process in America. Our prices and product is the best in the market. We have just about any kind of option you can think of. For more info on how to place a order please contact us and check out our how to order page. Staff that will help you make a transaction with our company smooth and simple. More than one graphic per order without the set fees and minimums. Keeping customers in control of how orders are placed while maintaining cheap prices. 1: First we call up our mill in Canada and order another batch of thin maple ply’s. 2: A week later that batch of maple ply wood arrives at our door. 3: Veneer ply’s cut into rectangular sections that are a little bigger that the area of a skateboard deck. 4: Then the ply’s are slipped through the glue machine to ensure the right amount of glue to make a perfect skateboard. 5: Generally glue covers 7 ply’s then slapped together and placed in our skateboard mold. The press adds just the right amount of pressure to make sure that all ply’s are touching and give a good bond in order to hold up under the most extreme skateboarder. 6: A hydraulic press applies pressure to the mold in addition to squeezing out extra glue. 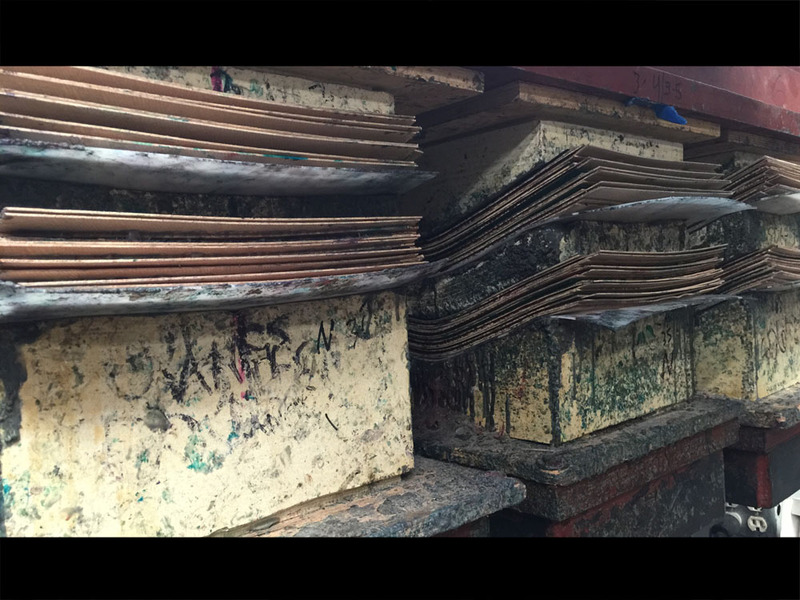 Only a press made just for skateboard manufacturing facility as a result of a high quality deck. 7: Unloading the press after some time will reveal a formed ply stack of wood. After 48 hours has passed the cutting process can take place to reveal a skateboard shape. 1: Machining skateboards using CNC machine cuts board shapes exactly the same every time. 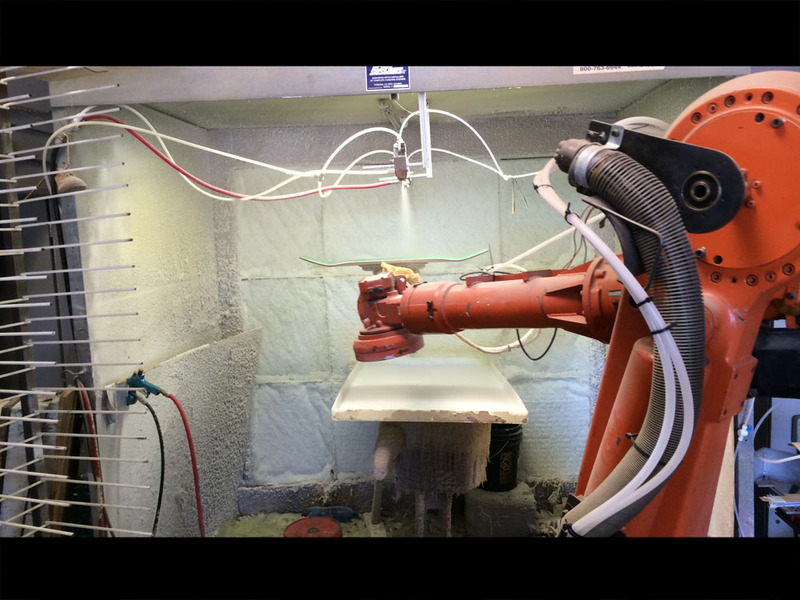 2: Automated robotic systems cut edges of the board using a radius bit. 3. Another robotic arm sands the rails exactly the same every time so workers avoid repetitive motion to keep morale up. 4. Boards are then sanded down and inspected for any imperfections in the surface. This is what our workers spend most of their time doing. We have eliminated many manual labor steps as a result we can focus on quality control. 1. 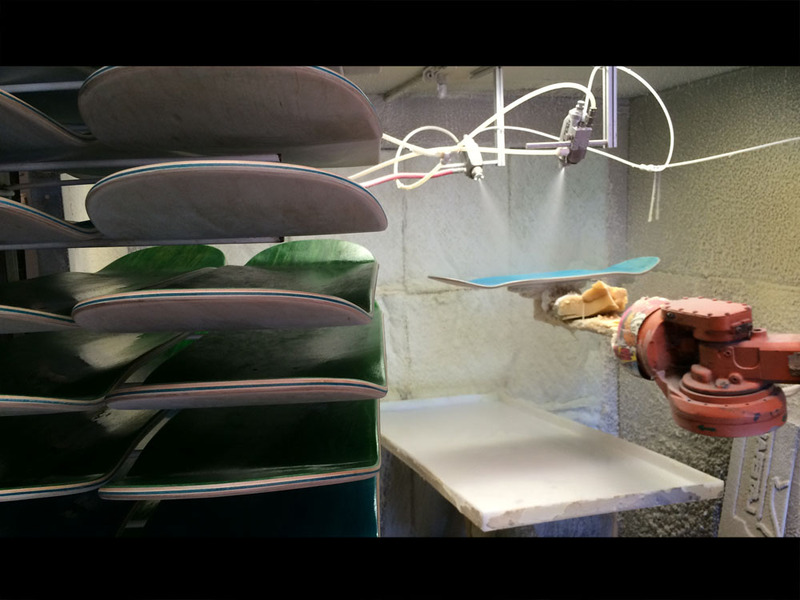 Applying clear lacquer using a spray booth sealing moisture inside the skateboard deck. Robotic machinery saves man hours while more resources focusing on consumers. 13. Finally to the print room to apply the graphics using a heat transfer that we have been making in our factory since 2002. Our heat transfers are one of a kind developed by the owner of the company many years of r&d went into the discover of this printing technology.